Victoria "Tora" Rocha: “I believe in showing your passion." Victoria “Tora” Rocha may now be known for her gardening prowess, but her 36-year career with the Oakland city government started in a much different, but no-less exciting job: an elephant trainer at the Oakland Zoo. After five years of pachyderm wrangling, Rocha moved on to another animal-keeper position, this time at Children’s Fairyland, which ended up setting her on the path to her current passion: the go-to person at Public Works responsible for Lake Merritt’s parks, and founder of the Pollinator Posse. At Fairyland, Rocha got an additional part-time job in landscape maintenance, where she worked with, and was inspired by, a group of dedicated and talented horticulturalists. In her current role as a Parks Supervisor, Rocha is in charge of the landscaping of public spaces downtown and around Lake Merritt. Her domain includes parks, the grounds of buildings like City Hall and the main library, the Morcom Rose Gardens, and of course, the Gardens at Lake Merritt. Located next to Children’s Fairyland at 666 Belleview Avenue, this somewhat hidden urban oasis built by gardening clubs in the 1950s now comprises seven acres of land, divided into several distinct types of plant environments, including the Pollinator Garden, the Mediterranean Garden, the Edible Garden, the Bonsai Garden, and the Dahlia Garden, among others. Six years ago, Rocha created one of the Gardens’ most popular events — dubbed “Most ‘Lit’ Festival” in 2016 by Express readers — the Autumn Lights Festival, a display of over a hundred locally produced, illuminated art installations. The festival was intended both to raise money for the Gardens, which currently don’t charge admission, and to increase awareness, as Oaklanders often tell Rocha they didn’t know the Gardens even existed. The Gardens are currently searching for artists to participate in the 2017 event. 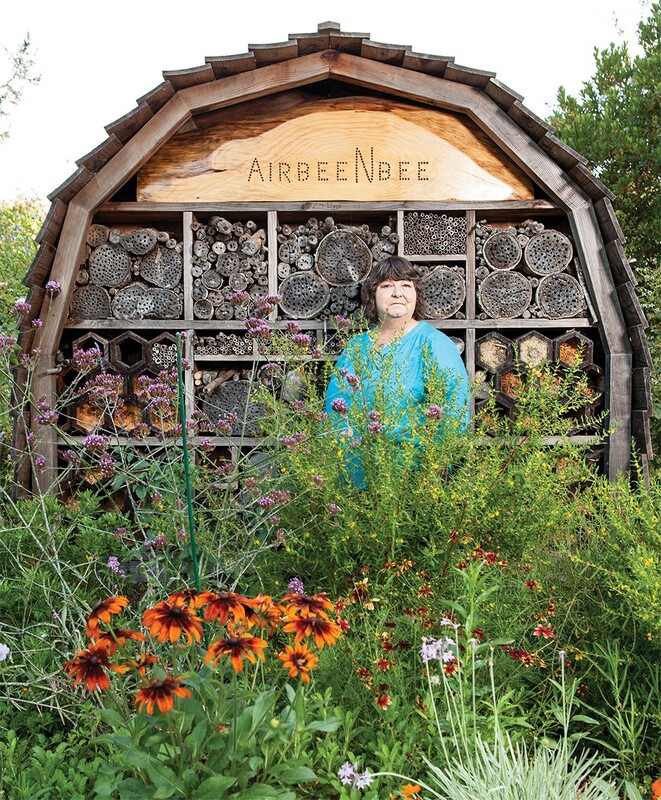 Rocha’s latest project, the Pollinator Posse, was created in 2013 off the inspiration of a Merritt College butterfly landscaping lecture and the 2010 documentary Queen of the Sun: What Are the Bees Telling Us? The Pollinator Posse is a nonprofit dedicated to creating spaces for pollinators around Oakland. In the last year alone, the Pollinator Posse says its saved more than 3,000 butterflies. The group also gives caterpillars to elementary school classrooms to “foster” as they transform into butterflies, and it recently started “Tees for Bees,” a program in which kids can hit pollinator-friendly seed balls at golf courses, which help make the courses more habitable for beneficial insects. The Gardens host volunteer days on the first and third Saturday of each month, from 9 a.m. to 1 p.m., with Pollinator Garden workdays on each third Saturday, from 10:30 a.m. to 1 p.m. The Gardens also offer free edible gardening workshops on many second Saturdays (August 12’s is titled “Create a Great Winter Garden”) and Rocha frequently speaks at garden clubs and nurseries around the East Bay.